OUTBOUND E-newsletter: Stretch PE Film: Is Manual or Machine the Right Type for You? Stretch PE Film: Is Manual or Machine the Right Type for You? Stretch film or wrap, a highly stretchable polyethylene (PE) film, provides flexibility and durability to properly pack stacked products and pallets. Stretch film offers high elongation characteristics and elastic recovery in order to keep items tightly bound when wrapping items together for packaging, shipping, transport and storage. 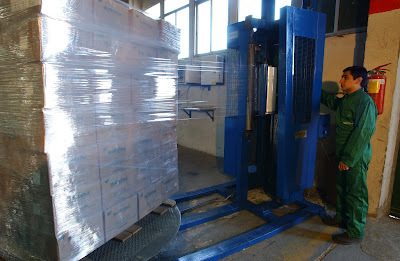 Although frequently used to unitize pallet loads, stretch wrap can also be used for bundling smaller items. Stretch film can be applied either manually (by hand) or by machine. It is important that the user evaluates needs and resources to best determine whether manual or machine stretch film is more appropriate. The right choice improves efficiency and reduces unnecessary costs. Designed to be applied manually by hand, manual stretch film is also known as hand film, hand stretch wrap, hand wrap or manual pallet wrap. Companies more effectively utilize this type of stretch film for lower capacity packaging operations, such as packing or storing small bundles of items, products, and boxes, as well as smaller stacked pallets. PE film manufacturers offer manual stretch film in light-weight hand reels and in smaller sizes to reduce operator fatigue. 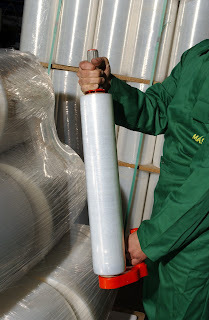 Using manual stretch film does not need investment in a machine wrapper; a company will only inquire labor costs of the operator hired to wrap items. Choosing the right stretch applicator, manual vs. machine, will result in more efficient and cost effective packaging operations. If a company wraps large pallets for shipping, transportation, or storing, then machine stretch film provides the right characteristics for the job. 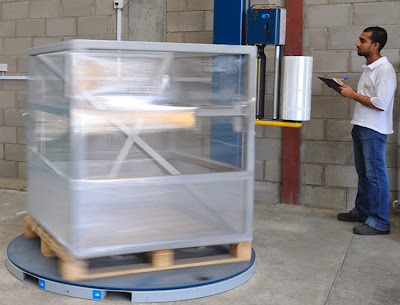 An automatic or semi-automatic stretch film machine wraps pallets and products ensuring faster and more efficient packaging, more secure loads, safer application, and lower labor costs. Common machine stretch film types: cast machine stretch film, blown machine film and converted films. A company must evaluate whether they are capable to inquire the short term high cost of investing in a stretch wrap machine in order to benefit from long term cost effectiveness.